The 26th Fajr Cup of Chess Games (Oxin Cup) is holding in Amol, Iran from 2018.02.03 to 2018.02.10. The tournament has been taken place in Oxin City Center of Amol. 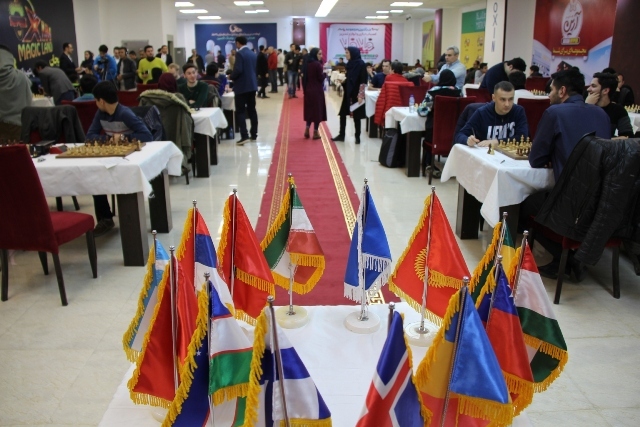 This tournament enjoys the participation of forty-six well-known and popular foreign players from different countries including France, Russia, Ukraine, Belarus, Portugal, Luxembourg, Turkey, Denmark, Ireland, Australia, Armenia, Azerbaijan, Kyrgyzstan, Georgia, Turkmenistan, Afghanistan, Malaysia, Sri Lanka, India, China, Ghana, South Africa, Iraq and Syria. Furthermore, about 350 Iranian players have attending the tournament including the main members of Iranian women’s and men’s National Team. A large number of international chess players took part in 26th Fajr Cup Chess Tournament including Shahin Hajiyaf, the Turkish chess player; Georgian Grandmaster, Giga Couparadze; Sri Lankan teenage sister chess, Banila Mates Archeschi, the popular Russian Grandmaster Pavel Ponkartov; International Grandmaster of ladies, Sireanoush Ghukassian, also the member of the Armenian National Team; Georgian Grandmaster, Davit Magalashvili; Grandmaster and famous Armenian coach, Arsene Yukiazarian; FIDE master, Dr. Seyed Vahabdin Mirzad the captain of Afghnistan National Team; Grandmaster Volodymyr Vetoshko, the Captain of Ukrainian Youth National Team; Indian international master, Himalayan Guzine; Azerbaijani Grandmaster Azar Miriruzoev; Ukrainian FIDE Master, Yuri Krykn and the world's other chess players. This tournament of chess games attracted great attention of many good and worthy top Iranian national chess players. The 26th Fajr Cup is a Swiss-system tournament. The players play with each other through nine round Swiss-system. Cash prize for the top players in the tournament has been assigned around a total of about 2000 dollars. Dr. Daneshvar, the managment of Oxin City Center of Amol refered to the readiness of Oxin in conducting Fajr International Chess Tournament in Amol, Iran. Furthermore, Dr. Hamid Taheri Pour, Senior Management of Oxin, supported the tournament. Dr. Daneshvar pointed out that there is a complete preparation for conducting Fajr International Chess Tournament. There is a hope that that Oxin City Center and its staff could do all their attempts to assist country youth and prepare the necessary equipment for their free time and healthy recreations. He also emphasized that we support the holding of chess tournaments and any social event that has cultural impact.